Opinion in the UK is currently divided on whether or not progress in manufacturing and digital technology is a good or bad thing. 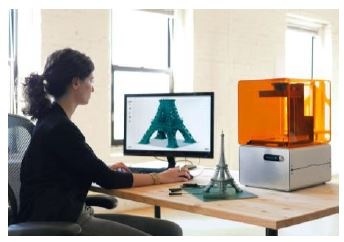 As part of a major new exhibition about the future of manufacturing (The Future is Here, 24 July – 29 October), the Design Museum has carried out a survey with Ipsos MORI which reveals that just 6%, or one in 17 people in the UK, have an interest in owning a 3D printer. 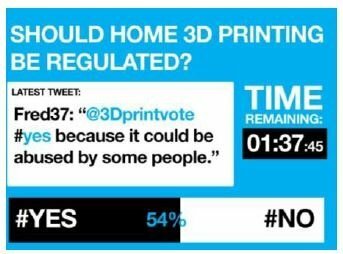 The large majority (71%) say they have heard not very much or nothing at all about 3D printing. The poll, which interviewed 994 people across Great Britain, gives a snapshot of the nation’s attitudes towards this emerging technology. It analyses views on the pace of change and pressures brought about by radical developments in technology that are putting the individual at the centre of the design and manufacturing industry. The trend for custom made furniture and personalised trainers is making its way – via open source design files online and desktop 3D printers – into the home. But is this an invasion of technology, or is does it signal the advent of an age when the barriers of access to design and making will ebb away forever? The Design Museum is collaborating with the UK’s innovation agency, the Technology Strategy Board, to deliver a major new exhibition about the sweeping changes in manufacturing that are transforming our world. New manufacturing techniques will involve the users of products as never before, revolutionising the role of the consumer. How we manufacture, fund, distribute, and buy everything from cars to shoes is progressing fast. The Future is Here shows what that means for all of us. The boundaries between designer, maker and consumer are disappearing with a growing movement of ‘hacktivists’, who share and download digital designs online in order to customise them for new uses. In a highly experimental move the museum will house the first ‘Factory’ of its kind where visitors can discover how 3D printing works and witness live production. The exhibition looks at what exactly drives innovation and how it can lead to increased productivity and economic growth. A visit will reveal how the new industrial revolution has the potential to affect everyone, radically altering our attitudes to the pace of change driven by new technology. Emerging technologies and platforms such as crowd funding, social networking digital looms, online marketplaces, 3D printing, nanotechnology, biotech, networked manufacturing, CNC [computer numerical controlled] routing and open-source micro computing, are all removing the barriers of access to manufacturing. It is the role of designers and the design process to participate in exciting new technologies, so that more people than ever before can take part in the production of our physical world. The Future is Here presents today’s emerging technologies that will become the growth sectors of tomorrow. ‘The role of the Technology Strategy Board is to sponsor exciting and high-value business-led innovation in the UK and we’re proud of the fact that over 60% of our R&D investment goes to small and medium sized companies, where so much innovation takes place. We’re delighted to support this exhibition as both a wonderful showcase for innovative, disruptive technologies – many of which are already having a profound effect on our lives – and as a snapshot of some of the businesses we’ve supported on their journey to commercial success.